The Marsh Widowbird Euplectes hartlaubi breeding male is black with a long tail, white bill, and yellow or orange and buff shoulder patches. The patches resemble those of the Fan-tailed Widowbird but the tail is longer in the Marsh Widowbird. 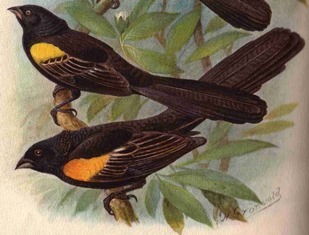 In Kenya the similar Yellow-mantled Widowbird has yellow epaulets while these are orange in the Marsh Widowbird, and further south the Yellow-mantled Widowbird is distinguished by a yellow mantle. The non-breeding male Marsh Widowbird is dull with coloured epaulets and dark wings. The female is dull with a dusky underwing and buff underparts. The Marsh Widowbird inhabits swampy grasslands and nearby cultivated areas. It may visit deeper water in reeds, perching on floating lily leaves or other floating vegetation. 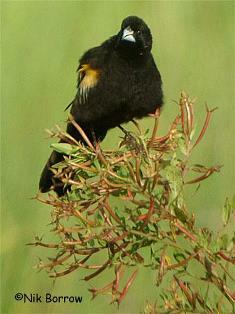 The Marsh Widowbird feeds on grass seeds, insects including grasshoppers and small fruit and berries. It usually forages in small groups, often with other widowbirds. 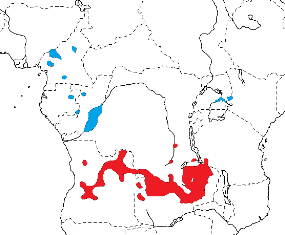 The Marsh Widowbird is polygynous. The nest is spherical, with a side entrance. The male builds the outer frame of the nest, using fine grass stems and incorporating living grass, which forms a bower over the nest. The female adds lining of dry grass, and continues to add lining after the first eggs have been laid. The nest is placed low down, usually within 20 cm of the ground, in wet areas with dense grass. The clutch is 1-3 eggs, which are pale greenish-blue or olive-green, marked with spots and blotches. There is no other information on breeding. There are no PHOWN records for the Marsh Widowbird (see PHOWN summary), and many are needed of this species. Submit any weaver nest records to PHOWN (PHOtos of Weaver Nests) via the Virtual Museum upload site.